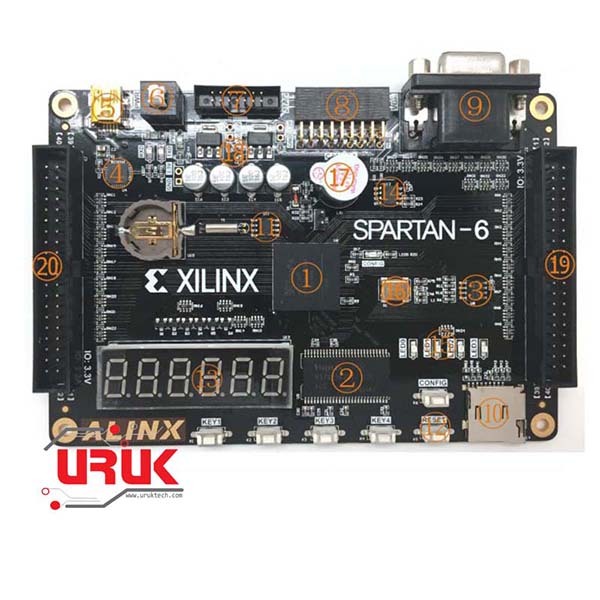 بورد FPGA نوع Xiling Spartan 6 متكامل ذو مواصفات عالية جداً مع كافة الملحقات الخاصة بالربط والبرمجة مناسب لجميع التطبيقات التعليمية والبحثية والصناعية. 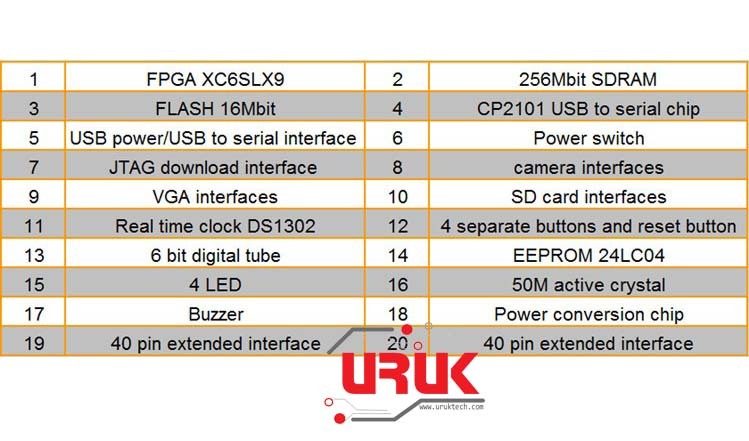 – FPGA chip: Main chip is XC6SLX9-2FTG256C, the chip is BGA package, 256 pins. Pin name is in the form of letter + number, such as E3, G3. – Voltage: 5V, USB interface power supply. – USB interface power supply, also a USB to serial port. – A large-capacity 256Mbit SDRAM, can be used as data buffer. – A 16Mbit SPI FLASH, can be used as FPGA configuration files and user data storage. – A camera interface, you can connect 5 million pixel camera such as OV5640. – A 16bit VGA interface, can display 65,536 colors, you can display color images and other information. – An RTC real-time clock, with battery holder, battery model is CR1220. – An IIC interface EEPROM 24LC04. – A Reset key, reset program for FPGA. – A CONFIG key, connects to the dedicated FPGA_PROGRAM_B pin, for reconfiguration of the FPGA program. – On-board 50M active crystal, provides a stable clock source for the development board. – Two 40-pin standard AX expansion port (2.54mm pitch), 34 IO ports, one 5V power supply, two 3.3V power supply, three GND. It can connect two expansion modules at the same time, such as 4.3-inch TFT module and AD / DA module. – A JTAG interface, FPGA debugging and program curing. – A MicroSD card connector, support SPI mode. – A 6bit digital tube. – Only this compatible solution supports firmware upgrades perfectly. – Fully supports all CPLD/FPGA devices on the Xilinx. – Support JTAG, Slave, Serial, SPI download mode. – The target device voltage is compatible with the 1.2V-5V, automatically discriminating and adapting to the target board I/O voltage. – Support for IMPACT and ChipScope. – Target device Downloader, clock selectable, up to 24 MHz. – Support multiple operating systems: XP, Vista, 2000, WIN7, WIN8, RedHat, Enterprise, Linux, Linux Enterprise. USB interface power supply, also a USB to serial port. A large-capacity 256Mbit SDRAM, can be used as data buffer. A 16Mbit SPI FLASH, can be used as FPGA configuration files and user data storage. A camera interface, you can connect 5 million pixel camera such as OV5640. A 16bit VGA interface, can display 65,536 colors, you can display color images and other information. An RTC real-time clock, with battery holder, battery model is CR1220. An IIC interface EEPROM 24LC04. A Reset key, reset program for FPGA. A CONFIG key, connects to the dedicated FPGA_PROGRAM_B pin, for reconfiguration of the FPGA program. On-board 50M active crystal, provides a stable clock source for the development board. Two 40-pin standard AX expansion port (2.54mm pitch), 34 IO ports, one 5V power supply, two 3.3V power supply, three GND. It can connect two expansion modules at the same time, such as 4.3-inch TFT module and AD / DA module. A JTAG interface, FPGA debugging and program curing. A MicroSD card connector, support SPI mode. Only this compatible solution supports firmware upgrades perfectly. Fully supports all CPLD/FPGA devices on the Xilinx. Support JTAG, Slave, Serial, SPI download mode. The target device voltage is compatible with the 1.2V-5V, automatically discriminating and adapting to the target board I/O voltage. Support for IMPACT and ChipScope. Target device Downloader, clock selectable, up to 24 MHz. Support multiple operating systems: XP, Vista, 2000, WIN7, WIN8, RedHat, Enterprise, Linux, Linux Enterprise. JTAG has a signal isolation processing, perfect protection of your equipment, safe use. بورد FPGA نوع سايكلون 2 من شركة Altera مع المبرمجة والكيبل الخاص به، البورد مخصص لتطوير البرامج وجدا مناسب للطلبة والباحثين. احدث ما وصلنا … اي فيديو من كامرة مثل الكامرات المربوطة على الدرون والطائرات المسيرة او اي فيديو مثلا لكامرة على سيارة روبوت، تكدر تعرض الفيديو بشكل مباشر على اللابتوب او اي حاسبة. جبنالكم ادابتبر (كارد) خاص ينربط على الـ USB وبدون اي تجهيز قدرة خارجي تستعملة حتى تعرض اي فيديو على حاسبتك وتسجل هم ويعمل على كل انواع الوندوز والماك هم. This is Arduino Starter Kit suitable for the programming and electronic’s beginners. It contains many kinds of different electronic components.